A cat spooked a television reporter when it jumped on the woman’s back as she did a live shot in front of a camera for a local newscast. 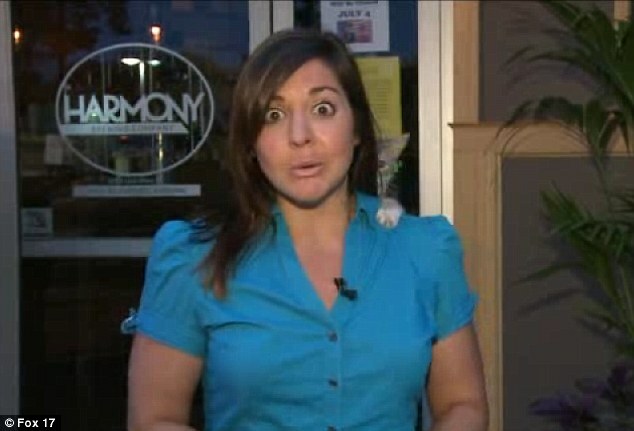 Nicole DiDonato, a morning reporter for Fox 17 in Grand Rapids, Michigan, did a live report on Thursday about the day’s happenings following the Fourth of July when a gray cat sneaked up from behind and jumped on the journalist’s shoulder. Ms DiDonato continued to finish her report before she broke out into laughter as the cat remained on her left shoulder the entire time. The reporter’s shot was one of three in a segment of upcoming stories the morning after this week’s Independence Day. Ms DiDonato appeared calm and unaware that a feline was nearby as she began to report on the city celebrating its new title as BeerCity USA. Suddenly, the arm of a cat leaped in the air onto the front of Ms DiDonato’s left shoulder as a surprise to both the reporter and the audience watching the shot. The journalist’s face lit up in shock making it clear she had no idea the cat would interrupt her work. The cat made its appearance as it peeped its head from behind Ms DiDonato’s until it clearly showed its face to viewers. No longer camera-shy, the animal managed to prop itself completely on top of the reporter’s shoulder making itself comfortable. Remarkably, Ms DiDonato barely hesitated as she continued to do her report despite having an unplanned feline resting on her. At one point, she turned her head to the right in embarrassment – and the cat followed her direction. After she completed her report, Ms DiDonato began to laugh uncontrollably nearly falling to the ground. The cat did not move from her shoulder. On Twitter, Ms DiDonato said she had seen the cat before she went live on air. Ms DiDonato went on to tweet: ‘Gotta hand it to the little guy, his strength and athleticism… mighty impressive. The reporter expressed her relief that the cat was a friendly one.